From her lofty perch, a snow scorpionfly surveys a wintry landscape. With the return of cold winter weather to our region, is it time to bid farewell to outdoor insects we have visited in many episodes of Bug of the Week? Not at all! Even on chilly days in December and January, many cold hardy insects enjoy their day in the winter sun. Just a few weeks ago, in a soggy hollow of a lowland forest, two of our graduate students discovered snow scorpionflies, one of the rarest insects we will meet in Bug of the Week. Snow scorpionflies are not scorpions nor are they flies. 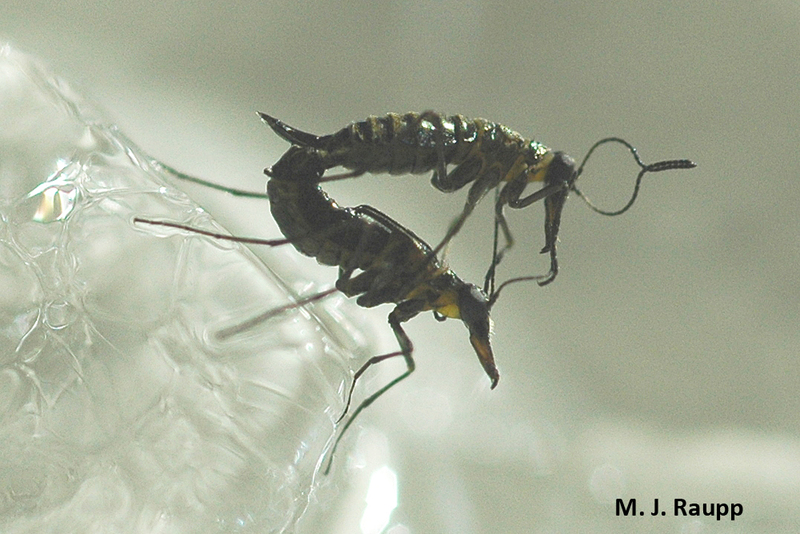 Neither snow nor ice can cool the romance between male and female scorpionflies. They belong to a small order of insects known as Mecoptera. The “scorpion” moniker derives from the fact that males in this group have unusually large and upward curving genitalia that resemble the stinger of a scorpion. The “fly” part of the name comes from the fact many species of Mecoptera have wings and can, well, fly. The tiny snow scorpionflies featured in this Bug of the Week do, in fact, lack functional wings, and cannot fly. Go figure. Most species of snow scorpionflies are boreal and live in chilly places such as Alaska and Canada or occupy high elevations in mountains. They are active during the colder months of the year and can be seen with some regularity hopping about in the snow. 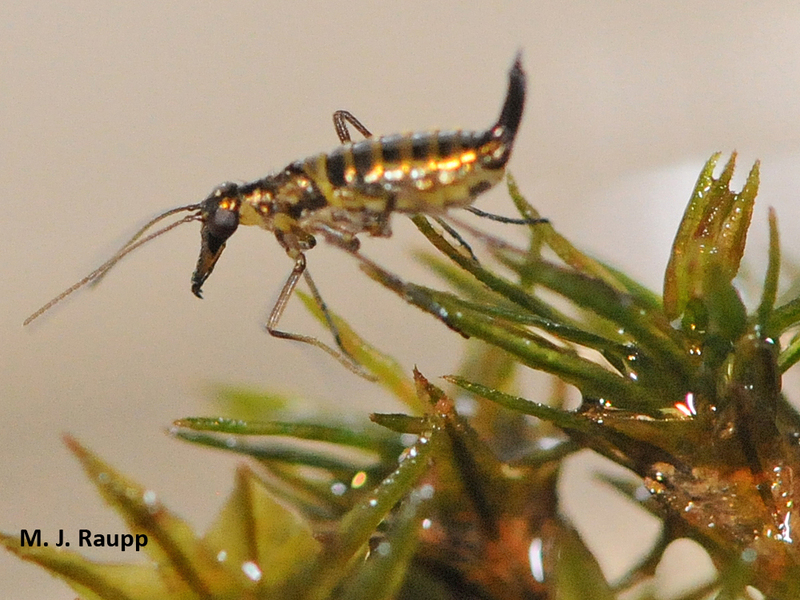 However, in Maryland snow scorpionflies can be found in the dead of winter on snow or ice, and even on the mosses and liverworts that serve as food for both adults and their larvae. In one of the more curious mating rituals in the insect world, the male scorpionfly grasps the female and places her on his back for a nuptial ride. If you hope to glimpse these fascinating creatures, dress warmly and bring along your magnifying glass. Snow scorps are tiny insects usually five or less millimeters long. Snow scorpionflies are believed to be the ancient relatives of one of our more well known and itchy insect friends, the flea. Many thanks to Chris Taylor, Tom Pike, and Jeff Shultz for sharing their snow scorpionflies for this Bug of the Week.